Samsung may have lost the patent battle against Apple, but that doesn’t mean the Korean electronics giant has quieted down. 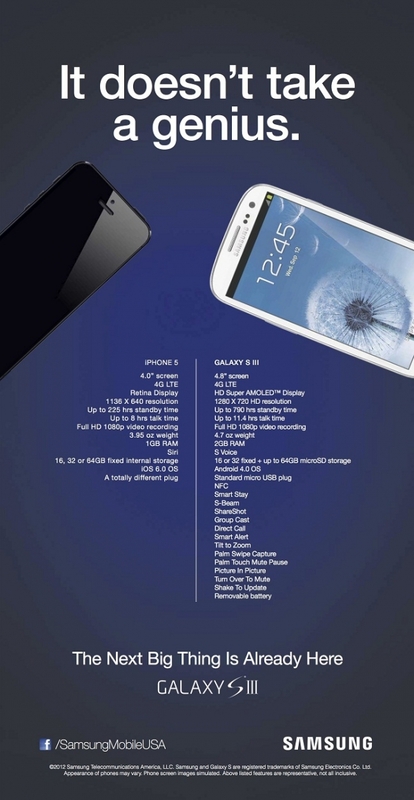 In a new ad shown that will start running in various US national and regional papers on Sunday, Samsung has stacked the specifications of its Galaxy S III smartphone against the newly-announced iPhone 5. What’s first noticeable about the ad is its tagline, which is an obvious jab at Apple: “It doesn’t take a genius”. Not only does this reference Apple’s “genius” retail employees, Samsung also implies that deciding between the two devices is a piece of cake. The Galaxy S III’s list of features is much longer than the iPhone 5, and its specs beat Apple’s latest smartphone in terms of HD resolution, talk time and RAM. It also features near-field communications (NFC) technology — not included in the iPhone 5 — which allows users to pay at checkout with a mobile phone. The ad also pokes fun at the iPhone 5′s specs wording, dismissing Apple’s new Lightning dock as “a totally different plug”. Samsung has been touting the capabilities of its devices more aggressively lately, in an attempt to determine iPhone users to move to Android and leave Apple aside. I personally prefer Samsung over Apple but I didn't like Samsung ad that states: “Our phone is better because our contrived spec list is longer!” The truth is that the bottom half of the Galaxy S III’s specs on this ad are meaningless. Apparently, although Galaxy S III’s hardware specifications are seen as superior to those of iPhone 5, the latter has already seen great demand in the US, only hours after the pre-order period started. This shows that iPhone buyers are less interested in the specs sheet of the device than Samsung would have hoped for, and that they are fond of the experience and the ecosystem that Apple offers to them. Apple iPhone 5 isn’t the biggest or most powerful smartphone on the block. But that may not matter to iPhone purists, those who have fallen in love with the original iPhone 4 designs and were horrified at the thought that their precious device might develop a glandular condition and grow to near-tablet sized proportions. I got to spend a little time with one of the many iPhone 5 phones Apple had lying around the demo room (and in the hands of demonstrators). At first glance, I’d say Apple has achieved something remarkable: making the iPhone bigger, more powerful, and possibly even better, without changing the way it feels in your hand. In case you haven’t seen, the new iPhone 5 looks a lot like the iPhone 4S. It’s got the same curves, the same half-inch-plus margins above and below the screen, the same single button on the face and the same volume and lock buttons on the side, but there are crucial differences, some more significant than others. First of all, this phone is light. As soon I pick it up, I noted the lack of heft. The iPhone 4 and 4S both feel somewhat substantial in your hands. The iPhone 5 feels different (at 112 grams, it’s 20 percent lighter than the previous iPhone). It’s noticeably thinner (7.6 mm, or 18% thinner than the iPhone 4S). Apple did away with the glass back, which may have helped the phone shed an ounce or so. That back is now the same brushed aluminum as the edges (or brushed black aluminum, depending on your choice). It looks good and feels great. You won’t miss the glass back. Apple also moved the audio jack to the bottom of the device; I like it there. It’s a lot more elegant than having that cable jutting out of the top and possibly draping over you screen. That same base also houses the new lightning jack. It’s positively tiny compared to the old 30-pin jack, and it doesn’t care which way you plug it in. It’s simple, smart touches like this that appeal to me. I’m certain most customers will appreciate them as well. The biggest and most obvious difference between the iPhone 4S and the new iPhone 5 is the screen. It’s still a super-brilliant, high-resolution Retina display, but this one is noticeably longer than any iPhone that’s come before it. It’s a neat trick, because, while the screen is now bigger (1136 pixels deep), the phone feels exactly the same in your hands. You simply get more vertical real-estate. On the home-screen, this means another row of app icons. For apps and content, the screen offers more room to deliver interaction and information. Put another way, the old iPhone had a 3:2 aspect ratio screen and the iPhone 5 has a 16:9 ratio screen. This will be a better screen for HD movies and TV (for which it won’t have to show black bars on the top and bottom). Some movies aren’t shot in 16:9 (the Avengers is, and it looks great on the new screen), but pretty much all modern TV is. Apple obviously packed a lot more power into the new iPhone, adding the new multi-core A6 CPU (no one seems to know if it’s dual core or quad core) for faster performance and richer onscreen graphics. The game demos during the unveiling looked impressive — especially Real Racing 3 with the real-time rear-view mirror view. Unfortunately, none of the iPhone 5s in the demo room were loaded with games. Even so, I did notice that app loads and switching seemed a bit peppier. The new iOS 6 Apple maps looked sharp, especially the 3D flyover, which basically draws 3D-rendered buildings with real photography draped over them in real time. On the other hand, I did a similar walkthrough on the new A5-based iPod touch 7th generation and it was almost exactly as good. iOS 6 also brings a redesigned camera. Powered by the A6 chip, it’s supposed to deliver better low-light performance and noise reduction. I couldn’t really test that out in the demo area, but I was able to test-drive the new Panorama mode. The idea is not new: take a 180-degree arc, or even a 360-degree circle of pictures, and the camera stitches them together. I’ve tried this already on Android tablets and my Sony NEX-5 camera. That said, the iPhone 5’s implementation is good. It offers just enough guidance as your shooting (“slow down,” “move lower”) that almost anyone can create interesting panoramic views. Siri got a little work done, too. As promised, she can now tell you sports scores and launch apps. I asked her how the Mets did today, and she responded with information and a nice visual for the upcoming game. When I asked about the Giants, she gave me a score for the football team, but neglected to ask if I meant the football or baseball Giants. When I pointed out her mistake, she apologized, but didn’t rectify it. Siri’s new-found ability to launch apps was pretty impressive. I asked her to launch Passbook and it appeared almost immediately. I got the same rapid respond with third-party apps such as CNN. Passbook looks just as good as it did when Apple unveiled it at WWDC earlier this year. But seems no nearer to becoming a true digital wallet app. Yes, you’ve got important things like plane tickets and coupons, but nothing for making mobile digital payments. Perhaps this is because Apple chose not to include NFC in the iPhone 5. As with Passbook, many of the best things about the new iPhone 5 may come from iOS 6, which will launch along with the phone and is available as an upgrade for all iPhone owners going back to the iPhone 3GS. On the other hand, not all of the phones made prior to the iPhone 4S will be able to take advantage of these new features (Siri is one obvious example). They should all see the new iTunes store, though, which happens to look at lot like the Apple TV interface. I thought it was well organized and more navigable than any previous versions of iTunes on the iPhone. The iPhone 5 is, finally, an LTE phone, but until I get it in the real-world it’s hard to assess how much of an impact that will have on day-to-day use. Likewise with the new 802.11N radio; I know it’s going to be faster, but I’d need a lot more real-world use to assess the quality of that connection. Apple unveiled the iPhone 5 on Wednesday and will begin selling it next week. It also lowered prices for older models. Here's a look at the key differences between the iPhone 5, 4S and 4. - Display: 4-inch (diagonal) with a resolution of 1136 by 640 pixels. - Cameras: 8-megapixel camera on back, 1.2-megapixel on front. - Battery life: talk time is up to 8 hours on 3G. Internet works for up to 8 hours on LTE and up to 10 hours on Wi-Fi. Up to 10 hours of video playback. Battery can be replaced by service personnel only. - Release date: Sept. 21, 2012. - Display: 3.5-inch (diagonal) with a resolution of 960 by 640 pixels. - Battery: talk time is up to 8 hours on 3G, up to 14 hours on 2G. Internet works for up to p to 6 hours on 3G, and up to 9 hours on Wi-Fi, one hour shorter than the iPhone 4. Up to 10 hours of video playback. - Battery: talk time is up to 7 hours on 3G and up to 14 hours on 2G. Internet works for up to 6 hours on 3G and up to 10 hours on Wi-Fi. Up to 10 hours of video playback. Over the coming weeks, many will compare the iPhone 5 to a variety of Android devices, including the large and powerful Samsung Galaxy SIII. I’m not sure how the iPhone 5 will hold up. It does not raise the bar much further than competing devices. Its screen is still smaller, its CPU may not be as fast and it lacks NFC. And yet, I wonder if iPhone customers will care. The iPhone 5 offers myriad differences that will improve their day-to-day smartphone experience, while still delivering one of the most aesthetically pleasing handhelds on the market. For many, I bet that will be enough. Of course, I won’t have my final say until we get a review unit and pound the heck out of it. I can’t wait.